Learn to Salsa, Cha Cha, Tango, and Swing/Jive your way to fun and inspiration. Ballroom and Latin Dancing – as seen on such television shows as “So You Think You Can Dance” and “Dancing with the Stars”- focus on music from the Swing and Big Band era as well as from such Latin American countries as Cuba, Mexico, and Argentina. These traditional Ballroom and Latin steps can also be used in pop, folk, and contemporary music. Join Robert Tang & Beverley Cayton-Tang from danceScape for a fun session. They are former 3-time Canadian and 2-time North American Ballroom Champions, as seen on Dragons’ Den (CBC), Healthy Gourmet (Oprah Winfrey Network), ParticipACTION’s “Get Inspired. Get Moving.” fitness campaign, Canada in a Day (CTV), and Marilyn Denis Show. When: Saturday, Jan. 27th, 6:30 to 9:00 p.m. Admission: $8.00 in advance, $10.00 at door (Admission includes refreshments and entry for door prizes.) #shallwedance? 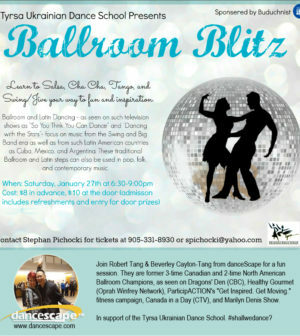 Contact: Stephan Pichocki for tickets spichocki@dancescape.com or call 905 331-8930.